One part of my skincare routine I've always missed out is the toner/exfoliant stage. I always felt like the ones on offer were far too harsh for my skin and I never felt I was missing out on something special. Over the last few months I've had some pesky dry patches on my T zone area which wouldn't budge and as my skin is naturally oily, it was some new territory I wasn't used to dealing with. While picking up my favourite moisturiser during Escentuals 1/3 off french skincare, I decided to add the La Roche-Posay Effaclar Astringent Micro-Exfoliant Lotion to my basket to finally sort the problem out. 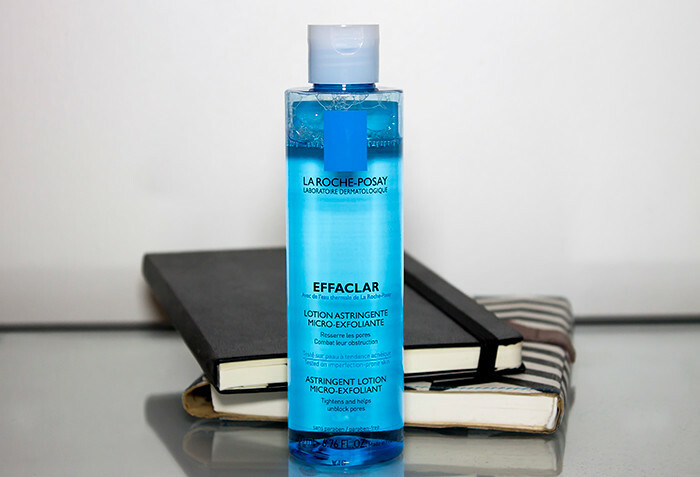 I've always got on well with La Roche-Posay's skincare, especially the Effaclar range so I had high hopes for this product. It's basically an exfoliating lotion which helps reduce pore size and unclogs the pores with the help of sebum regulating cleaning agents and purifying lipo-hydroxy-acids (LHA's). Usually I don't expect skincare to work too quickly, but the results were almost instantaneous. After sweeping on the solution with a cotton pad my skin felt instantly smooth. Smoother than it's ever felt. All those horrible dry patches I've been trying to get rid of for months were swept away in a single moment and the results carried on to the next day. So achieving a smooth surface was fairly easy, but what about unclogging those pores? Well that did take a little while longer but I noticed any blackheads or blockages I had were starting to come to the surface. Even blackheads I didn't even know I had which I'd mistaken for scarring had now been brought up to the surface, ready for extraction. I'm so impressed with what this product could do and everything it claims to do, it achieves it better than you could imagine. I still have a little longer to go in achieving a perfectly smooth surface but it's safe to say this isn't leaving my skincare routine anytime soon. If you like the sound of it, definitely pick it up while it's 1/3 off during the month of March at Escentual, you won't be disappointed!